Are your old windows in need of an upgrade? While wood or vinyl windows are cost-effective options, more and more homeowners are choosing fiberglass instead for their replacement window project. If you're looking for versatility and durability, fiberglass windows offer several benefits that might make them the perfect fit for your home. Kuhn Construction installs top-tier fiberglass windows for homeowners throughout New York. We will work with you to create the perfect frame, styled and colored to match your home's décor. To see if fiberglass windows are right for your home, schedule a free estimate with us today! 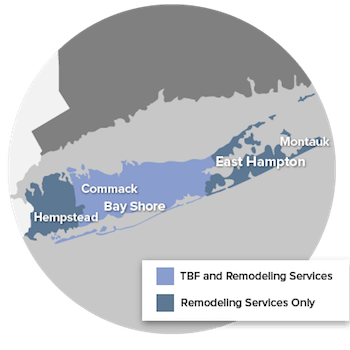 We serve homeowners in Islip, Brookhaven, Smithtown and areas nearby. Engineered to withstand strong forces, fiberglass windows are the best option if you're looking to invest in a long-term solution to your replacement window needs. Through a process called pultrusion, the materials that make up a fiberglass frame are combined to provide superior tensile and torsion strength. This creates an ultra-strong window, capable of safely holding large panes of glass. Because fiberglass windows don't expand very much, their seals break much less frequently than with vinyl or wood windows. This means that energy loss due to fiberglass windows is usually negligible. If a primary motivation for your replacement window project is to reduce utilities costs or increase home comfort, fiberglass can reliably deliver high energy efficiency. No matter what style of window you decide is right for you, our capable technicians will ensure a flawless installation and an attractive finish. Interested in fiberglass windows? Call us at 1-844-801-2652 or contact us online to schedule a free estimate in Islip, Brookhaven, Smithtown, Huntington Station, Babylon, Riverhead, Farmingville, Bay Shore, Brentwood, West Babylon, and areas nearby.